In the video above you can see me unpacking my new Voltaic 18 Watt Solar Charger Kit from Voltaic Systems. This simple solar power kit features a V60 battery, a small 3-panel circuit box, and three 6 watt solar panels. When combined, the three panels in this inexpensive solar kit provide you with 18 total watts of charging power – enough to power smart phones, camera batteries, tablets, and even laptop computers. 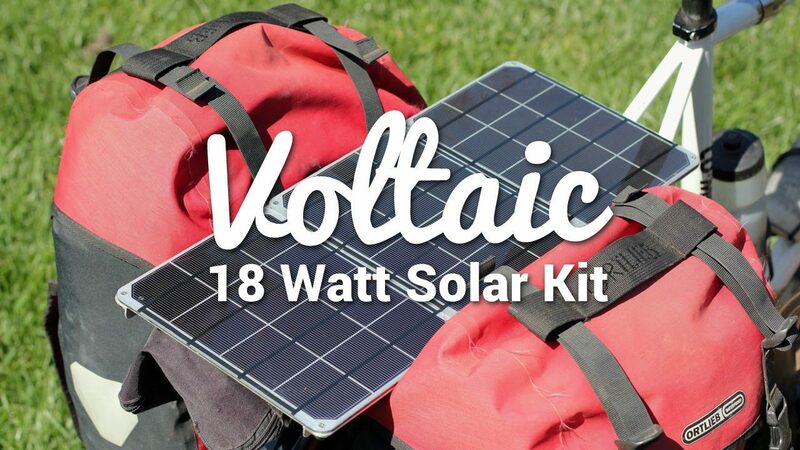 I purchased the Voltaic 18 Watt Solar Kit after the incredible success of the Voltaic Fuse 4 Watt – a product I used on my recent 14-month-long bicycle tour in Europe and Africa. It’s larger cousin, the Fuse 10 Watt, is more powerful, and also works extremely well. But with my upcoming bicycle tour through Europe and Asia just around the corner (see here for my 2014 bicycle touring itinerary), I decided to go pro with my solar charging capabilities this time around. Being able to charge my iPod touch and my GoPro video camera while cycling across Europe and Africa in 2012 and 2013 was awesome, but this year I want to be able to charge all of the electronic items I’m carrying with me… and that means being able to power an iPhone, multiple DSLR lithium camera batteries and a MacBook Pro laptop computer. In order to power the electronics I’ll be carrying with me this year, I needed to upgrade my wattage. The small 4 watt Fuse won’t work this time around. It’s simply not powerful enough to charge a laptop computer in a timely manner. And even though I love the Voltaic Fuse 10 Watt, it’s a little too big to carry strapped to the rear rack of my bicycle (I could do it, but it just doesn’t look right. It’s a little too large and little too cumbersome.) So, that’s why I purchased the Voltaic 18 Watt Solar Charger Kit. The main difference between the 18 Watt Charger Kit and the 10 Watt Fuse is that the Fuse is a finished product. It consists of three solar panels mounted to a black zippered case, with the battery inside. You simply order the thing and it is ready to use as soon as it arrives. The 18 Watt Charger Kit, however, is purposely shipped in pieces and needs to be put together once you get it. Luckily, this is very easy to do, thanks to Voltaic’s simple and easy-to-use product designs. The advantage of the kit over the finished product is that because the kit does not come with the black case found on Voltaic’s Fuse products, you can mount the solar panels in any arrangement you like… and the end product is a whole lot lighter. I didn’t really talk about my plans for mounting the solar panels in the video at the top of this page, but what I plan to do is this: I plan to mount at least two of the three solar panels that come in the 18 Watt Kit to the rear rack of my bicycle. This will give me a 12 Watt power outage (with just two panels mounted) and if I can manage to fit the third panel somewhere on the bike, that will give me a total 18 watts of charging power. The battery will then be stored inside one of my bicycle panniers and I will be able to charge my electronics all day long while I am slowly cycling my way around Europe and Asia later this year. I’m not exactly sure how the whole thing is going to work at the moment. I don’t know where or how exactly I am going to mount the solar panels, but I will let you know how it works out just as soon as I have it sorted. Stay tuned for future updates! 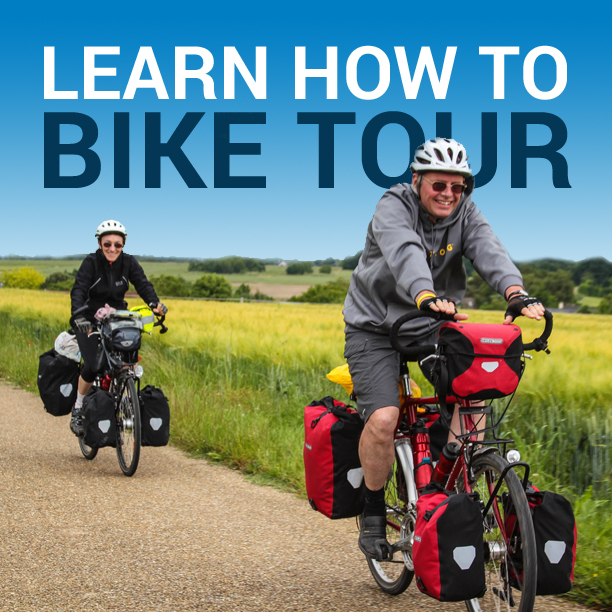 To learn more about using solar power to charge and re-charge your electronic devices when bicycle touring, be sure to read my detailed review of the Voltaic Fuse 4 Watt Solar Panel… or visit the Voltaic System’s website where they have an entire section devoted to bicycle touring. This entry was posted in Bicycle Touring Pro Articles, Darren Alff's Bike Tour Blog, Electronics, Products, Tech, Videos and tagged camera solar charger, fuse, iphone solar charger, laptop solar charger, solar charger, solar charger for bicycle, solar power, solar power for bike, voltaic, voltaic 18 watt, voltaic solar charger kit, voltaic systems.